A patient kindly sent this note out of gratitude for our services and his care experience. It is our prerogative at East Coast and Broward North to help patients reach their postoperative goals and return to their quality of life. I was recently a patient of Dr. Naide, and had an anterior approach total hip replacement done by him. The best way to describe my experience is unbelievable. I received the best medical care I have ever experienced. Dr. Naide and his staff with the Joint Center are incredible. This group definitely set the care standard that all medical professionals should be held to. There were so many wonderful people who were involved in my care. I am home now and feeling great, as if nothing every occurred. I cannot speak highly enough of Dr. Steven Naide and his staff at Broward North. If ever I need future medical care, Broward North is where I will go. We received a glowing letter of thanks from this patient, whose wife elected to have surgery with Dr. Naide here in Florida. Our doctors, staff, and cooperating hospital do everything possible to make sure each patient has quality surgery experience. 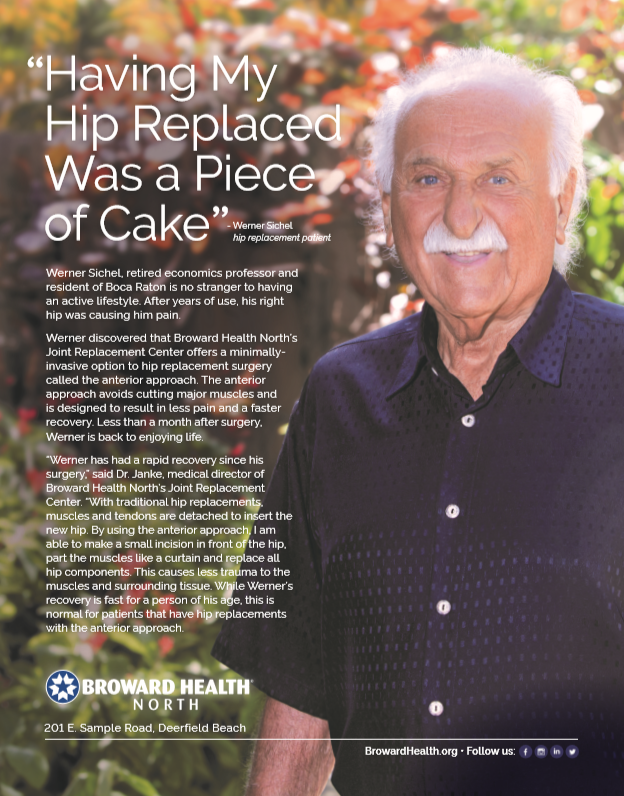 The purpose of this communication is to share our story regarding an amazingly positive recent experience with Dr. Steven Naide, the East Coast Orthopaedics Team and the Broward Health North facility and staff. My wife and I are residents of northern Michigan with a second home in South Florida. Last fall, my wife experienced a period of significant physical distress, which led to a diagnosis requiring that she go through a procedure to replace her left knee. Our original assumption was that we would use the Mayo Clinic staff and facilities for these services. But in late November by coincidence, we happened to see Dr. Naide on national television in a program that discussed some of the unique procedures he had developed. We met with Dr. Naide to discuss his approach to knee replacements following which we made the decision to utilize his services. Dr. Naide performed the surgery at the Broward Health North facility. We could not have been more impressed. As Dr. Naide described it, the the result was picture perfect. He monitored and directed the preoperative, operative, postoperative and follow up care with precision, compassion, and care. The East Coast Orthopaedics team, also flawless, was very much in evidence. I am informed that Dr. Naide has also worked closely with the Broward Health North staff to assist them in delivering a spectacular patient experience. Every element, including physical therapy, pre-op, surgery, post-op, and follow-up care during our experience was at a “Ritz Carlton” level. During our experience we came into contact with a total of 62 members of the Broward North staff. Without fail, from security and maintenance personnel to charge nurses, each individual went out for their way to ensure a positive experience and outcome. I cannot recommend Dr. Naide and his staff in high enough terms. They are exactly what today’s sophisticated patient should be looking for. One of our sweet patients sent this thank you letter to Dr. Naide after the success she had with her hip replacement. We love getting notes like these, and hearing that our patients have an improved quality of life following their operations. The amazing success I’ve had with this hip replacement compelled me to write to you. After leaving Florida and through travelling to New Jersey, I had no discomfort at all. We have just returned from a trip which included much walking, climbing stairs, up and down hills, on and off buses- many with high steps to negotiate. I had absolutely no problem; in fact, I frequently led the group in speed. This final positive experience (there have been many) is what led me to finally write this letter. I am doing so well, back to my fitness of years ago, and I believe all this is thanks to you. Dr. Naide Listed as TOP DOCTOR in Boca Life! 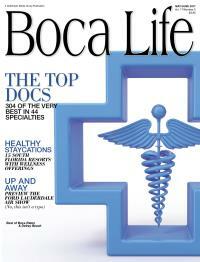 Dr. Naide has been listed as a Top Doctor by Castle Connolly in this month’s issue of Boca Life magazine!